Weld Wizard 9003 is a high quality citric acid based liquid used as the electrolyte for electro-chemical removal of weld discoloration and other scale. 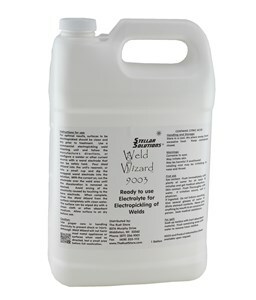 Weld Wizard 9003 is intended only for use with electro-chemical weld cleaners. For manual cleaning of stainless steel welds, use Weld Wizard 9700. Thoroughly clean the parts to be treated so they are free of dirt, grease or oils. Use an electro-chemical weld cleaning unit and follow the manufacturer's directions, or configure a welder or other current source with a "wand" electrode that can be held safely. A flat stainless steel electrode works well. Copper also works, but will erode slowly. Wrap the exposed end of the wand completely in Scotchbrite, fiberglass cloth, or similar material. Clamp, or otherwise, attach the other electrode to the part being cleaned. Depending on the speed desired, the current can be set to 15-30 volts and 10 amps, AC or DC. If using DC, the negative (-) lead goes to the wand electrode and the positive (+) lead is clamped to the part. If the weld cleaning unit has a reservoir, fill it with Weld Wizard 9003 and operate as directed. Otherwise, pour some Weld Wizard 9003 into a small cup. Dip the wrapped end of the wand electrode into the solution to saturate the cloth. With the current turned on, place the soaked cloth on the weld area and gently move it over the surface until the weld discoloration is removed and the surface appearance is as desired. Avoid touching the part with the bare electrode as this will cause arcing of electricity to the part. Continue to dip the wand in the solution as necessary to keep it wet. Parts can also be immersed in a bath of Weld Wizard 9003. Use approximately 6 volts DC current, attach the positive (+) lead to the part(s) and let the negative (-) lead hang free in the solution where it will touch nothing. All electrically connected metal surfaces within the solution will experience electrochemical cleaning, though the degree may vary depending on geometry and electrode positioning. Reposition the negative lead as needed to insure proper current flow. Discontinue when the desired appearance is achieved. Rinse the surface thoroughly with clean water and dry completely in air before proceeding with passivation or other treatments to obtain the desired results. Drying can be accelerated by use of a hot air blower, hair dryer, clean cloth, or other drying medium. Repeat the process if necessary to obtain the desired results. Use proper care in handling electricity to prevent shock or injury. Rubber gloves and rubber soled shoes are recommended during use. Proper ventilation should be used to avoid breathing any vapors from the heated surface.